VETERAN John Flahive was among the star performers for London Heathside on Sunday when they club hosted their latest track and field meet at the Finsbury Park athletics track. 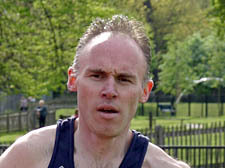 The distance runner overcame the conditions to power his way to victory in the 1500m in just under four and half minutes. Team-mates Mike Abrahams and Alex Beattie-Child also ran well to finish in seventh and eighth place respectively. Staying in the distance events, John Passmore hit home in 16mins, 46.3secs to win the 5000m, closely followed by Chris Hartley and Jacob Howe as Heathside completed a top three finish. Howe also went on to win the 800m in just over two minutes. Meanwhile rival running club, the Highgate Harriers were also out in force. Determined duo Greg Smith and Ross Curran sharpened their speeds for their upcoming Southern League Division One fixture with their best times of the season so far. Smith hit a time of 51.8secs to finish third in the 400m ‘A’ race, while Curran hit 52secs flat to finish fourth in the 400m ‘B’ event.